WASHINGTON, June 13, 2018 /PRNewswire-USNewswire/ -- The NFL and Howard University have partnered to launch the Campus Connection program, which aims to provide students with programs and experiences that help prepare them for future careers in professional football administration. The NFL and Howard University have partnered to launch the Campus Connection program. 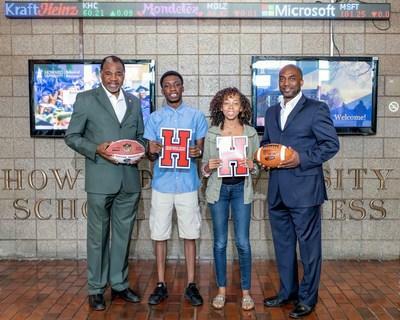 Pictured L to R: Howard University School of Business Dean Baron Harvey, Ph.D., Ninuola Onatemowo, a senior accounting student from Lagos, Nigeria; Cierra Wells, a senior international business student from Montgomery County, Md., and Associate Dean Anthony D. Wilbon, Ph.D.
Beginning with the 2018 fall semester, the NFL will have a presence on campus at Howard through several collaborative initiatives. Among other programs, the two organizations will host an executive lecture series, partner in a student-lab case study class and attend the Howard School of Business Sports & Entertainment Summit. "Campus Connection is part of our ongoing and continuous commitment to celebrating the impact HBCUs have had on the game of professional football, driving awareness around career opportunities, and providing access to the business of sport," said Troy Vincent, NFL Executive Vice President of Football Operations. The Campus Connection program is an extension of Strength of HBCUs, the NFL's broader partnership announced in May 2016 with the MEAC and SWAC, two preeminent Historically Black College & Universities (HBCU) athletic conferences. Through the partnership, the NFL and participating institutions seek to increase career opportunities for students and athletic administrators. "Howard University and the School of Business are excited about the developing partnership with the National Football League and its potentially beneficial opportunities for both organizations," said Dean Baron Harvey Ph.D., Howard University School of Business. "This collaboration will bring significant rewards to our faculty and students and provide them with great insight into the business of sports, while also developing skilled management professionals to meet the recruitment needs of the NFL. This NFL partnership has great potential and the School of Business is looking forward to our engagement." In addition to the NFL providing much-needed support to HBCU academic and athletic endeavors, students will benefit from programs that include internships at the club and league level, integration of HBCU football operations staff — including athletic trainers, video directors and equipment managers — into existing NFL platforms such as the Pro Bowl, and networking and mentorship opportunities.